In Rajasthan, renewables are a bright spot in a troubled national energy industry. 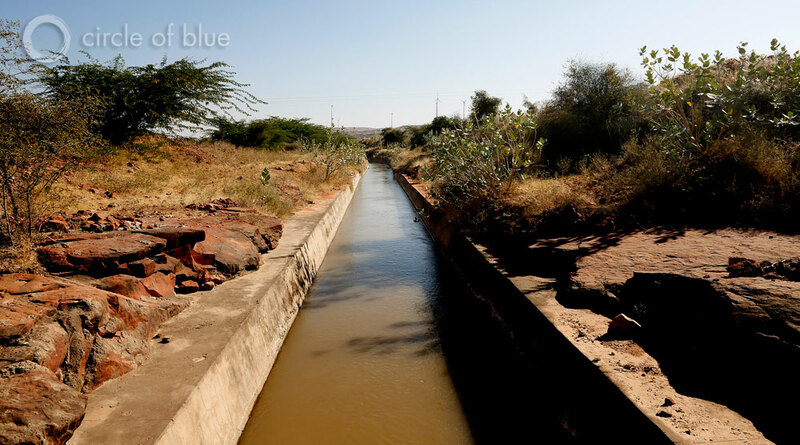 The Indira Gandhi Canal, constructed in the late 1950s and early 1960s, draws water from Punjab, in northwest India, and transports it hundreds of kilometers south to Rajasthan, where it serves as the state’s primary source of water for irrigation. Solar and wind energy development use virtually no water, a virtue in the hot and dry region. Click image to enlarge. JAIPUR, Rajasthan, India — Hawa Mahal, the Palace of Winds, was constructed in 1799, here in the largest city in India’s largest state. Made of red and pink sandstone, and facing the street with an ornate honeycomb of open windows, the five-story building could have been named the Hawa Suraja Mahal, the Palace of Sun and Wind. 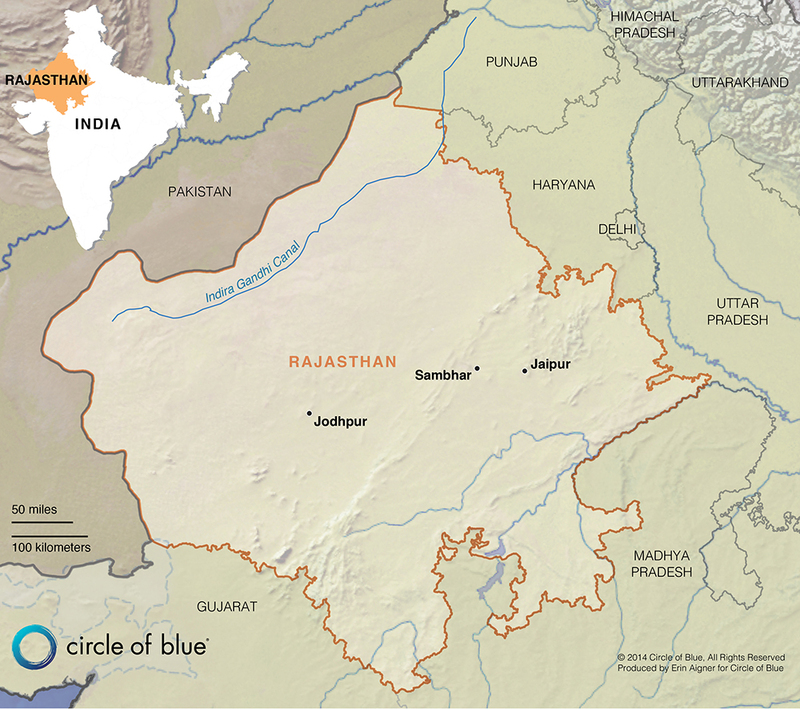 Rajasthan locator map. Map © Erin Aigner for Circle of Blue Click image to enlarge. Though the palace’s distinctive grill work ensured the privacy of royal women, its architect also sized the openings, and determined the building’s precise axis to the sun, to provide moderate winter heating, and produce the air flow and shading demanded by Maharashtra’s desperately hot summers. In a central-west Indian state as large the Republic of Congo, where six of every 10 square kilometers is desert, such understanding of the heating and cooling energy of the sun and the wind is generations old. Indeed, the brightest outlook in India’s deeply troubled energy sector, arguably the only truly encouraging prospect India holds for actually achieving its ambitious energy production goals, come with renewable energy, particularly the wind and solar industries. Since 2003, renewable energy technologies have added an average of 2,600 megawatts of electrical generating capacity annually, according to the Central Electric Authority. That represents 22 percent of the 11,805 megawatts of generating capacity that India added annually in the same time period. “People in this place have been working with nature’s energy, what we now call renewable energy, for a very long time,” says S.K. 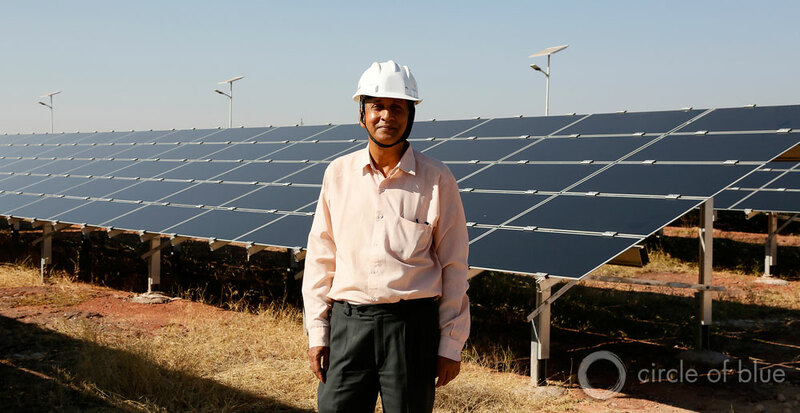 Mather, a wind and solar energy project officer with the Rajasthan Renewable Energy Corporation. “It’s one of the reasons we’re making good progress with our projects.” Click image to enlarge. Still, India’s total national electrical generating capacity was 237,000 megawatts (237 gigawatts) at the end of March 2014. The country’s leaders and energy development agencies, the Ministry of Power and the Central Electric Authority, assert that in order for India to attain 21st century standards of family incomes and economic development the country must generate at least 1,000 gigawatts of power — levels of electrical generating capacity comparable to the United States, China, and western Europe. Despite the long odds, India isn’t giving up. Can India Meet Its Ambitious Energy Goal? For decades India’s government and business leadership has made it clear they want to reach levels of personal income and modernization comparable to the United States, western Europe, and now China. To do so requires India to generate comparable levels of energy. Reporting by Circle of Blue finds that India is far from generating sufficient energy, particularly electrical energy, to fuel the nation’s current economic strategy. Moreover, Circle of Blue finds that India will not generate sufficient energy for decades, if ever. For instance, India’s plan to build 150 gigawatts (150,000 megawatts) of generating capacity from hydropower, by tapping the turbulent rivers of its five Himalayan states, has been slowed by climate change-related floods, civic opposition and technical challenges. Hydropower generating capacity reached 21.4 gigawatts in 2014. But since 2003, generating capacity from hydropower has increased less than 1 gigawatt annually. A gigawatt is 1,000 megawatts or about what a large coal or nuclear generating station produces. India’s total generating capacity from coal-fired power plants in its utility and captive power industry totals roughly 141 gigawatts and has grown by an average of 7 gigawatts annually since 2003. But the country’s capacity to fuel the plants with domestic coal has not matched demand. Imports of coal are quickly increasing, but new coal-fired plants are being idled or run at much lower capacity because of fuel shortages. India’s nuclear industry operates 20 reactors at six power plants that have the capacity to generate 4,780 megawatts (4.78 gigawatts) of electricity. India approved a plan in 2010 to add 58 gigawatts of nuclear generating capacity by 2032, but the 2011 nuclear accident in Fukushima, Japan complicated that schedule. Indian communities around proposed nuclear power plant sites generated mass protests that have significantly slowed India’s nuclear development options. Seven reactors are under construction with the capacity to generate 6,100 megawatts or 61 gigawatts. India also has trouble transporting its electricity. Government figures report that a quarter of the electricity generated across the country is lost in India’s inefficient, old transmission system. Perhaps 10 percent more, is stolen, according to local utility executives. An estimated 400 million residents of India do not have any electricity. India’s 12th Five-Year Plan called for spending $50 billion, $10 billon annually from 2012 to 2017, to modernize four existing energy transmission systems, construct a fifth new regional system in southern India, and link all of them into a national grid. The southern energy grid was finished last summer but getting all five grids to function efficiently as a national system has faltered. Blackouts and brownouts are common in almost all of India. And as India’s economy slows so has its investment in infrastructure. A World Bank study found that infrastructure investment reached a peak in 2010 of $72.3 billion, at the height of India’s growth. By 2012, infrastructure spending dropped to $31.2 billion. Four years ago, India established the Jawaharlal Nehru National Solar Mission to connect 22,000 megawatts of solar-powered energy to India’s transmission grid by 2022. That’s about 19,800 megawatts more solar generating capacity than was linked to the grid in January 2014. India also developed a solar city project —identifying 60 cities that could improve energy efficiency, reduce demand from coal-fired electricity, and offer subsides and incentives to increase production of solar energy. Similarly, India is counting on its wind energy industry to diversify its sources of electricity. The Center for Wind Energy Technology, a government research agency, estimates that India’s wind generating potential is 103,000 megawatts of generating capacity. The country has 16 wind manufacturing companies, which it asserts is second in the world behind China. As of January 2014, India’s wind generating capacity reached 20,298 megawatts, and was the world’s fifth largest producer behind China, the United States, Germany and Spain, according to the International Wind Energy Council, a trade group based in Amsterdam. How much more? A lot. And Rajasthan is among the select group of states that India is counting on to drive the nation’s renewable power industry. On January 29, three Central Government ministries and six utilities announced they had reached agreement to build a 4,400-megawatt solar photovoltaic plant on 19,000 acres near Sambhara, a desert city 75 kilometers (46 miles) west of here. The $4.4 billion project, which could be the world’s largest solar plant if built as planned, would generate 6.4 billion kilowatt hours of electricity. That’s roughly the same amount of power produced annually by two 1,000-megawatt coal fired power plants. Though such a massive solar plant consumes vastly more space than a fossil-fueled power plant, it prevents 4 million metric tons of carbon emissions to the atmosphere, according to the Ministry of New and Renewable Energy. 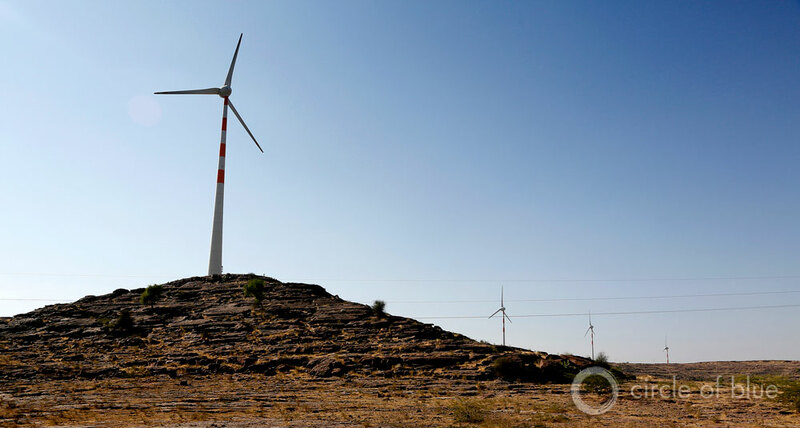 Further south and west of Jaipur, much smaller wind and energy plants have been built in the desert outside Jodhpur, a city of 1 million residents 330 kilometers (205 miles) from Jaipur. Alongside dry pastures where goats and sheep graze, and near tiny settlements of two-room stone and brick huts, the AES Corporation’s five-megawatt solar farm directs its blue photovoltaic panels to the fierce sun. Within easy eyesight, two other five-megawatt solar farms are in view. Distant mountain ridges support a long string of large wind turbines, their blades turning steadily in a strong breeze. This stretch of desert, lightly populated and ripe with solar and wind energy potential, represents almost precisely what Rajasthan and Delhi envision for a 21st century renewable energy sector. Winds are steady much of the year and the sun shines 325 days a year. In the desert outside Jodhpur, AES, an American energy developer, built a five-megawatt, $20 million solar photovoltaic power plant. This stretch of desert, lightly populated and ripe with solar energy potential, represents almost precisely what Rajasthan and Delhi envision for a 21st century renewable energy sector. The sun shines 325 days a year. Click image to enlarge. Jai Shanker Verma, the AES operations manager, said India’s Nehru National Solar Mission provided the financial incentives, and political security, for AES to build the $20 million plant in 2011. AES, an American energy supplier based in Arlington, Va., chose First Solar, also a U.S.-based manufacturer, to supply the 65,000 photovoltaic panels that cover almost 30 hectares (74 aces) of ground. A handful of men, ranging from unskilled watchmen to highly skilled technicians, manage the plant. So far, said Verma, AES is satisfied with what it’s found in India. 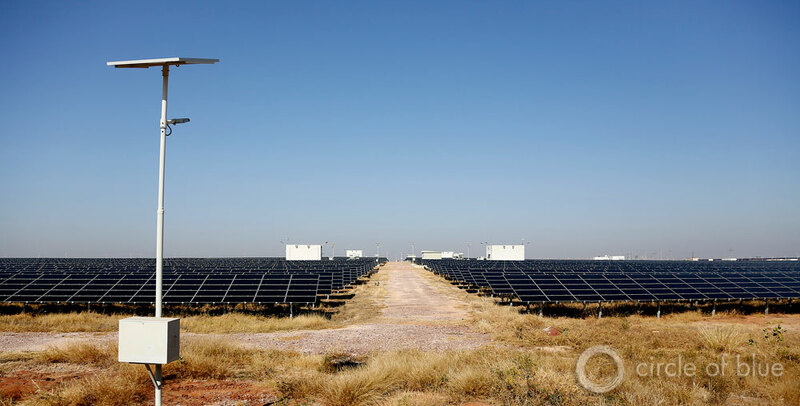 It built a 15-megawatt solar facility in neighboring Gujarat in 2012. The Jodhpur plant produces 9.1 million kilowatt hours of electricity annually, and power output is rising. On cloudy days the Jodhpur facility generates 5,000 to 6,000 kilowatt hours. On sunny days, the photovoltaic cells generate 25,000 to 30,000 kilowatt hours. Verma believes power generation at the facility will reach 10 million kilowatt hours this year. Infographic: India’s energy reserves, capacity, and potential renewable energy from 2008 to 2012 shows how energy is produced across the country. Click image to launch the interactive Google Fusion Tables map. Map © Luke Gehrke / Circle of Blue. As efficiency increases, the costs of generating electricity from photovoltaic panels are going down. If the same facility were built in 2014, said Verma, it would have cost 70 million rupees, or $11.5 million. Rajasthan is a big part of India’s renewable energy campaign. The state developed and approved policies a decade ago to provide financial incentives, accelerated permitting programs, and regulatory oversight for wind, solar, and biomass fueled power-generating stations. Many of those responsibilities are housed in B.K. Mahija’s office at the Rajasthan Renewable Energy Corporation, a public agency staffed with young engineers, and ruled by endless paperwork. 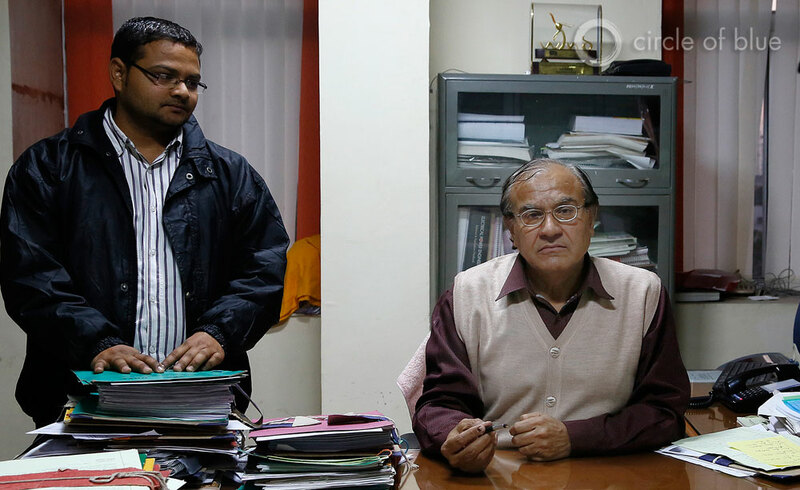 Mr. Mahija’s typical day is spending hours behind a large desk on the agency’s second floor, flanked by aides, and signing a continuous stream of documents that flow through the door. Sitting at his desk in Raipur, B.K. Mahija, the technical director of the Rajasthan Renewable Energy Corporation, oversee a public agency staffed with young engineers and challenged by relentless paperwork . “All day this goes on,” he says. “The phone rings and I sign memos.” Click image to enlarge. The state’s interest in renewable energy has enabled it to build or commission 10 solar plants and 669 megawatts of solar generating capacity, second only to Gujurat. Rajasthan also built or commissioned 2,729 megawatts of wind energy generating capacity, though interest in wind has slowed considerably. From 2010 to 2013 wind energy generating capacity grew an average of 540 megawatts annually. This year just 31 new megawatts of wind generating capacity are scheduled to be built in Rajasthan, according to state records. Like all of India’s electricity generating sectors, renewable energy developers are encountering significant impediments even as some mark achievements. In 2003, according to the Central Electric Authority, renewable fuels and technology accounted for 1,628 megawatts of generating capacity, or 1.5 percent of India’s total generating capacity of 108,000 megwatts. On January 1, 2014, all renewable generating capacity reached 30,178 megawatts, according to figures from the Ministry of New and Renewable Energy. That represented almost 13 percent of India’s total electrical generating capacity. Renewable technologies produced about 70 billion kilowatt hours of power, or about 8 percent of the country’s total electricity, enough to provide for 10 million average rural Indian households. India’s 12th and latest Five-Year Plan (2012-2017) asserts that the nation wants to drive down the amount of power it produces from coal, currently about 70 percent of generation, and steadily increase power generation from renewables, hydropower, and nuclear energy. 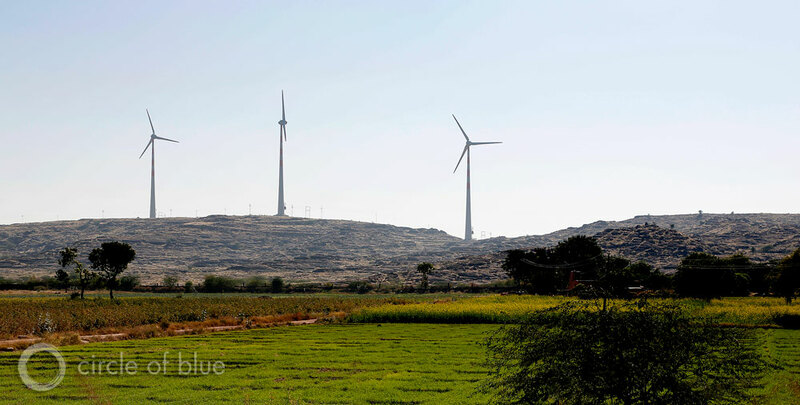 Rajasthan is developing wind energy power plants, like this one outside Jodhpur. Interest, though, is slowing because of difficulties the state is having transmitting the electricity. Just 31 new megawatts of wind generating capacity are scheduled to be built this year, down from an average of 540 megawatts of new generating capacity annually from 2010 to 2013. Click images to enlarge. The elegant heating and cooling designs incorporated into the Hawa Mahal could be a place for India to recognize that the low-cost and efficient techniques of the past are a place to start for building the pragmatic and prosperous Indian nation of this century. By 2030, according to planners, coal-fired generation could fall to 59 percent, renewables could increase to 16 percent, and hydro and nuclear could grow to 23 percent of India’s electricity mix. It’s unclear if India is capable of achieving those objectives. What’s not in doubt is the amount of energy potential from India’s wind and sun. The Center for Wind Energy Technology, a government research agency, estimates that India’s wind generating capacity is 103,000 megawatts. Indian scientists project that the solar energy potential from its sunny and dry southern states amounts to 20 to 30 megawatts of generating capacity per square kilometer. The Ministry of New and Renewable Energy estimates that India’s solar potential is at least 100,000 megawatts of generating capacity in the next several decades. The Hawa Mahal, the Palace of Winds, clearly shows that this region of India has understood the usefulness of joining the power of the sun and the wind for a very long time. The question in modern India is whether the country’s ambitious economic program can be supported by an equally expansive energy development campaign, some of which relies on renewable energy. The links between development and energy have been at the top of India’s national priorities since the country’s founding in 1947. In the decades since, India has wrapped itself in the steady rise of its energy development industries. But huge population growth, impractical economic development goals, the warming climate, rampant inefficiency, and a host of other ills are enfolding a nation that is soon to be the world’s largest.